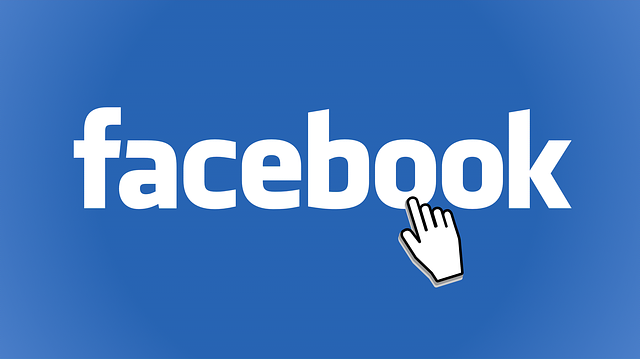 : Hello friends, Here we bring a very very good news for you. Here is a great opportunity for job seeking to be a part of Assam Police Recruitment 2018.Assam Police Department has 5759 Vacancies for Constable, Sub Inspector, and Jail Warder posts. But We are going to discuss here only the Assam police constable Un-Armed branch/ Armed Branch. 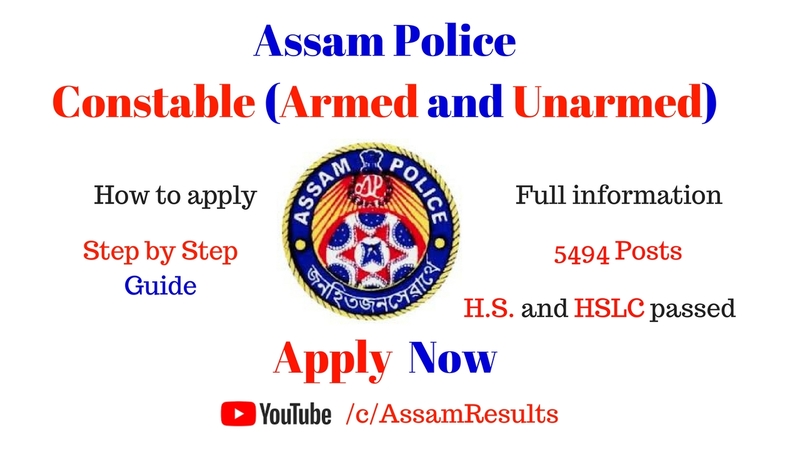 So, Read this article for the proper information and step by step guide for the Assam Police Recruitment 2018. 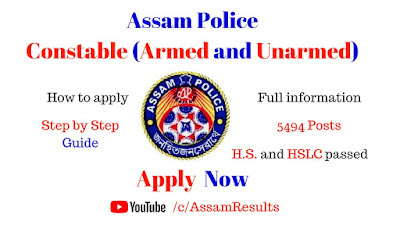 The Assam Police Department has rolled out a vacancy notification via assampolice.gov.in for the Assam Police Recruitment 2018 of 5494 candidates at Constable posts. The candidates, who desire to get these Assam Constable Job 2018 are humbly advised to submit their Assam Police Constable Application Form 2018 before given deadline i.e. 2nd June 2018. The newly offered Assam Constable Vacancies are undeniably some ravishing opportunities for all the eligible candidates, by which they can get a reputed government job. Age Limit: 18 to 25 years as on 1st January of 2018 (i.e. the candidate must be born on or before 01.01.2000 and on or after 01.01.1993). Un- Armed Branch: H.S. or Class XII passed from a recognized Board or Council for the post of Constable, Unarmed Branch, District Executive Force (DEF). Armed Branch: H.S.L.C or Class - X passed from a recognized Board or Council for the post of constable of Armed Branch. 1. Click on the apply Assam Police Online link provided below. 2. Enter all the required details in Assam Police Online Application Form. 3. Pay the Application Fee ( If Required). 4. 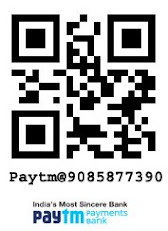 Scan & Upload all the required certificates along with Photograph (If Required). 4. Finally, Click on Submit Button to finish Assam Police Online Application Process. 5. Take Printout of Assam Police Jobs 2018 Application form for further use. Application Fee: No need to pay the Application fee. 1. Scrutiny of Documents: All the original documents along with a set of Photostat copies of the documents will be checked before the candidate is allowed to appear in the PST and PET as per the given eligibility criteria. 2. Physical Standard Test (PST): After the documents are found correct, the candidates will have to appear in the PST (Physical Standard Test). It will carry no marks. Measurement of the height, weight & chest (only males) of the candidates will be done using the latest technology and after which the candidate will be examined by a Medical Officer for preliminary check-ups like knock knee, vision test, colour blindness test, flat foot, varicose vein, physical deformities etc. Those who qualify in the PST will be subjected to 3.2km race to be completed within 14 minutes (840 seconds). 4. Written Test: Written test will consist of 100 multiple choice type questions to be answered on an OMR answer sheet.